Santa Maria degli Angeli in Assisi. The Basilica of Santa Maria degli Angeli (Saint Mary of the Angels) is a church situated in the plain at the foot of the hill of Assisi, Italy. The basilica was constructed between 1569 and 1679 enclosing the 9th century little church, the Porziuncola, the most sacred place for the Franciscans. It was here that the young Francis of Assisi understood his vocation and renounced the world in order to become a poor among the poor and thus started the Franciscan movement. After the death of Saint Francis in 1226, the friars built several small huts around the Porziuncola. In 1230 a refectory and some adjacent buildings were added. In the course of time little porticoes and accommodations for the friars were added around the Porziuncola. (some foundations of these were discovered during excavations under the floor of the present basilica between 1967 and 1969). As more and more vast numbers pilgrims came flocking to Assisi to receive the “Pardon of Assisi”, the small space of the Porziuncola became completely inadequate to house all these pilgrims. The necessity grew to build a church incorporating the Porziuncola. 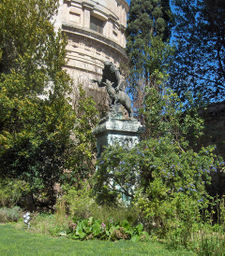 The buildings around the shrine were taken down by order of pope Pius V (1566-72), except the Chapel of the Transito, the cell in which St. Francis had died. Construction of the basilica started on 25 March 1569, This majestic church, the seventh largest Christian church, was designed in an Italian pre-Baroque style by the famous architect Galeazzo Alessi (1512-1572), assisted by Jacob Barozzi, also called Vignola (1507-73). The work progressed slowly, due to continuous lack of money as the building was financed with donations. The dome was finished in 1667. This dome, resting on an octagonal drum with eight windows and cornices, is an architectural work of art. Construction of the church was finally finished in 1679. In 1684 a bell tower was added. It was originally intended to have a twin tower, but the second was never built. On 15 March 1832 the central nave, a part of a lateral aisle and the choir collapsed during a violent earthquake. The dome, the only surviving work of Alessi, escaped destruction, but was left with a wide crack. The apse and the side chapels were left standing. Reconstruction of the basilica started in 1836 by the architect Luigi Poletti and it was finished in 1840. He had remodeled the façade in a neoclassical style. Between 1924 and 1930 this façade was given back its original pre-Baroque style by Cesare Bazzani. The gold-plated statue of the "Madonna degli Angeli" (Madonna of the Angels) by the sculptor Colasanti, was put on top of the façade in 1930. 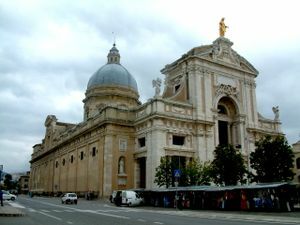 On 11 April, 1909, the church was raised by pope Pius X to the status of "patriarchal basilica and papal chapel"
The basilica has a rectangular ground plan, divided into a central nave and two lateral aisles, flanked by ten side chapels, with at the far end a transept, and a long choir in a semi-circular apse, protruding from the ground plan. The Porziuncola is situated directly under the dome. The church is 126 meters long, 65 meters large and the dome is 75 meters high. The interior is simple and yet elegant with only a few decorations, in stark contrast with the decorations of the side chapels. 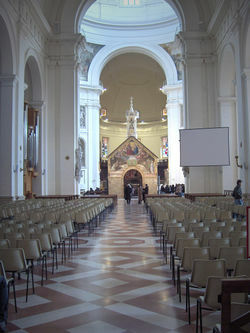 The nave and the aisles were rebuilt in neoclassical Doric style by Luigi Poletti. The apse holds the precious wooden choir, carved by Franciscan brothers starting in 1689, the papal cathedra (with bas-reliefs by E. Manfrini) and the papal altar. The Chapel of the Transito, the cell in which St. Francis died, is still preserved. It is situated under the bay of the choir, against the right columns of the dome. The chiesetta (little church) is the most sacred place for Franciscans. Francis was given this little church, dating from the 9th century, by the Benedictine monks. The church is exquisitely decorated by artists from different periods. Above the entrance is the fresco by Johann Friedrich Overbeck (1829) depicting St. Francis receiving from the Christ and the Virgin the indulgence, known as the “Pardon of Assisi”. The side wall on the right side shows fragments of two frescoes by an unknown Umbrian artists.. 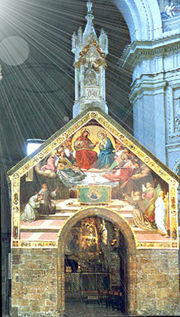 The austere interior is decorated in a simple Gothic style with frescoes from the 14th and the 15th century. But the masterpiece is the six-part fresco in the apse of this little church, painted by Ilario da Viterbo (1393). At the back, above the entrance, is the fresco “Crucifixion” by Pietro Vannucci, called “the Perugino”. A new crypt was constructed behind the altar between 1965 and 1970. During the excavations foundations of the original little huts, surrounding the Porziuncola, were exposed. The crypt’s altar rests on a massive, multiple-branched tree trunk, sculpted by Francesco Prosperi. Behind the altar stands an enameled, terracotta, bas-relief tabernacle by Andrea della Robbia, expressing with an extreme finesse the emotions of the figures : (on top) St Francis receiving the Stigmata, the Coronation of Mary (with the angel musicians), St Jerome the Penitent; (lower section) The Annunciation, the Nativity and the Adoration by the Magi. One enters the rose garden via the sacristy. It is the last remains of the ancient wood in which St Francis and his friars lived. Here he talked to the turtle doves, inviting them to praise the Lord. Doves have been nesting since times immemorial in the hands of the statue of St. Francis in this rose garden. According to tradition (already attested at the end of the 13th c.), one night St. Francis, feeling the temptation to abandon his way of life, rolled naked in the bramble thorns in an attempt to overcome doubt and temptation. In contact with his body, the bramble bushes turned into dog roses without thorns. Since then, the dog rose cultivar Rosa canina 'Assisiensis' has been grown in the garden. a wooden painting portrait of St. Francis by the (anonymous) Maestro di San Francesco (13th c.); the body of the deceased saint was placed on this painting. St. Francis and St. Clare by Cesare Sermei and his workshop. many frescoes of uncertain attribution.